To meet all political parties, for mobilising their support for the demands especially, the revival of BSNL. a) Approval for BSNL’s Land Management Policy without any delay. Extend financial support to BSNL, to ensure financial viability, as per the decision taken by the Group of Ministers, at the time of formation of BSNL. Issue letter of comfort for BSNL’s proposals for taking bank loans. Scrap the proposal for outsourcing for the maintenance of BSNL’s mobile towers. AIBDPA FULLY SUPPORTS THE DECISION AND CALLS UPON ALL ITS UNITS PARTICIPATE IN THE CAMPAIGN BY THE AUAB UNITS AND TO ORGANIZE SOLIDARITY DHARNA/ DEMONSTRATION DURING THE STRIKE. The strike was participated by the mainstream of the P and T workers since 1991, the first strike. After formation of BSNL, the workers participated as per the call of BSNL Employees Union. In the first strike, about 2 crore workers participated and in the last strike it was participated by more than 20 crores. UNITY AND STRUGGLE FOR PROGRESS! Massive Strike all over India, Congratulations! 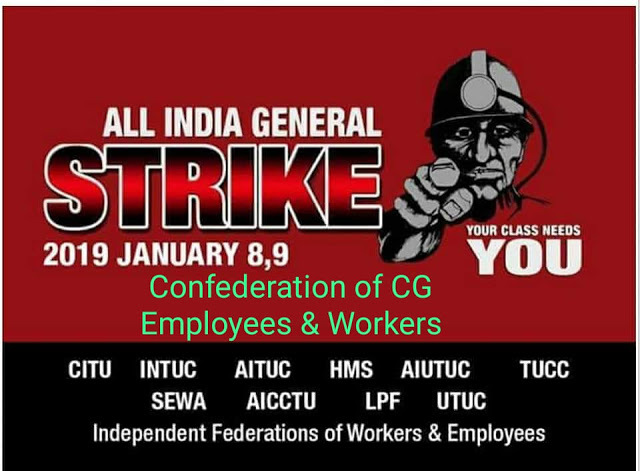 Today, 8th January, 2019 is the first day of the two-day nation-wide general strike call given jointly by 10 Central Trade Unions and independent Federations, against the anti-worker, anti-people and anti-national policies of the BJP-RSS led Central Government. The reports received from various states show the spontaneous response to the call from the workers in various states and various sectors of economy. Reports from the States of Assom, Manipur, Kerala, Odisha, Meghalaya, Puducherry show that there is complete shut down. Finance Sector, i.e. banking and insurance was closed for business even in Andaman islands. Electricity generation and distribution, coal extraction and movement is affected. Many state governments have declared holidays for schools in view of the strike. The BEST, Mumbai city road transport service provided by the Municipal Corporation, recorded a 100% strike. Very good strike in BSNL. There are reports of arrests of striking workers in Assom and West Bengal, slapping of ESMA and No Work No Pay notices, in various states. It is an attack on democracy, which we strongly condemn. Farmers across the country under the aegis of the Left peasant wings would join the two-day nationwide general strike on January 8 and 9 called by central trade unions against the alleged repressive policies for workers adopted by the Narendra Modi-led BJP government. “AIKS and Bhumi Adhikar Andolan will observe ‘gramin hartal’, rail roko and road roko on January 8 and 9, the day trade unions are observing nationwide general strike. This move is against the Modi government’s failure to address rural distress issues, to save rural farmers’ lands from the corporates. The farmers will extend all support to the ensuing general strike,” said Hannan Mollah, general secretary of the CPI(M)-affiliated All India Kisan Sabha. Atul Kumar Anjaan of the CPI’s peasant wing said that the action committee of farmers in their meeting decided that when the workers, employees and common people are protesting against the Modi government’s policies, the farmers will also join them. “The farmers will join road jam, demonstration, protest meetings throughout the country to make the nationwide strike a success and register their disenchantment with PM Narendra Modi and his policies,” said Anjaan. Anjaan said that the farmers organisations who last year organised a massive march on November 29, 30 in front of Parliament were of the opinion that four-and-a- half years of the Modi government failed to fulfil promises made by the BJP. Tapan Sen, general secretary of CITU, said that the public sector employees, unorganised sector workers, port and dock workers, bank and insurance employees are going to observe nationwide protest on January 8 and 9 against growing economic crisis, price rise and acute unemployment on the call of central trade unions and mass organisations. The CITU denounced the unilateral move of the government of India to amend the Trade Union Act 1926 in the name of bringing about “so-called transparency” and avoiding “duplicacy” as noted in the press briefing by the union cabinet. Sen alleged that the proposed Trade Union (Amendment) Bill 2018 as cleared by the Cabinet is designed to impose conditions of slavery on the working people and totally abrogate trade union rights. “It is not merely labour reform, it is an all-out degeneration in the life of productive people in the whole economy,” Sen said. He alleged that under the regime of the Modi government a repressive atmosphere has been created for working class people. “It is just not distress and destitution, there is an altogether a repressive atmosphere creating in the total uncertainty in the world of works,” Sen alleged. CITU was critical of the Modi government’s policy of ‘Make in India’ and alleged that the government has been killing the work culture of the country’s public sectors by favouring major contracts of manufacturing works to private players. “In Rafale deal, there was no transfer of technology. State owned HAL was kept away from the entire deal. This government will do similar practice when it will sign another two mega defence deals for F-16 fighter aircraft with Lockheed Martin Corporation of US and purchase of Naval frigates from Russia,” said Sen. He was also critical on the Modi government’s move to purchase rail locomotive and coaches from foreign company. “Our movement is getting stronger every year. This is the 18th nationwide general strike against the government’s anti-worker policies. The main aim of our 12-point charter of demands is to revive the country’s economy, save the rights of working class,” Sen added. Ten trade unions who have jointly called for the nationwide general strike are INTUC, AITUC, HMS, CITU, AIUTUC, AICCTU, UTUC, TUCC, LPF and SEWA. The entire trade union movement in the country have jointly given a call for two days countrywide general strike on 8-9 January 2019 against anti-labour, anti-people and anti-national policies of BJP-led NDA Government, from the National Convention of Workers held on 28th September 2018 at New Delhi. The Ten Central Trade Unions, Independent Federations and Associations of various sectors have been consistently fighting against the policies of BJP-led NDA Government with two successful general strikes, one on 2nd September 2015, and then on 2nd September 2016. After that a three day Mahapadav on 9-10-11 November 2017 at Parliament was held with massive mobilisation of workers, followed by general strike by almost 80 lakhs of Anganwadi-Asha-Mid Day Meal Workers & other scheme workers on 17th January, 2018 for regularization and implementation of unanimous recommendations of 45thIndian Labour Conference to give them “Worker” status and social security, as well as satyagraha protest actions in January and February 2018 all over country were organised jointly by the unions in districts and state capitals. Besides these, in between, big agitations by sectoral unions at national and state level and the agitations by various sectors have been organised throughout this period. The Central Government failed to respond, refused any dialogue, undermined tripartism, did not hold Indian Labour Conference for the last more than three and half years and instead, continued its aggressive attack with arrogance on the lives and livelihood of the working people. Desperate attempts are being made to make gross pro-employer changes in labour laws, both piecemeal and also hastening the codification of 44 central laws into four, totally ignoring the viewpoints of trade unions. An attempt is being made to usurp funds accumulated in various welfare boards, in the name of providing “universal Social Security”. Unilaterally and through arbitrary notification on fixed term employment through executive order on the one hand and through gradual replacement of workers by apprentices in various establishments on the other, the very concept of regular employment and job security is being sought to be wiped out from the workplaces. Now the cabinet has come out with amendments into the Trade Union Act, 1926 which are irrational, highly discretionary and extremely damaging to the independent functioning of unions. It is designed with the dubious intention to cripple unions, to promote pocket unions or tout unions. At the same time, the Govt policy of mass privatization of strategic PSUs, crucial infrastructure and public utilities, specially targeting the ports, airports, telecom, financial sector etc, with defense production and railways thrown open for 100% FDI, is aimed at loot of the national assets and resources on the one hand and destruction of country’s economic base on the other. In this background the preparations of strike are receiving support from all sections of the society. The unions in Banks, Insurances, and Coal and non-Coal mines, Petroleum, Post, Telecom, Engineering, Manufacturing, Steel, Defense, Health, Education, Water managements & projects, those in Power/Electricity, Road Transport, the Central & State Government employees and Auto-Taxi unions etc and so on have served required notices of strike at their union levels to the appropriate authorities. The unions in the unorganized sector are well in preparations for massive strike action along with rastaroko, rail roko type of agitations through massive mobilizations. Railway unions have expressed their support and would organise solidarity actions. The unions and associations of agricultural workers, plantation workers, scheme workers, construction, beedi, vendors-hawkers, hamalies/loaders-unloaders, and others are mobilizing for show of strength on streets during two strike-days. Modi Government, in the last three months, since we declared our decision of two days general strike from the National Convention of workers on 28th September 2018, has increased its pace of attacks on workers instead of dialogue with unions. With every passing day, the Government is coming forward with more of aggressive policies to ruthlessly cripple public sector undertakings and to safeguard the loot by the corporate houses through provisions of IBC Act and various other measures to the detriment to economy. The farming communities through their associations have also extended support to the strike as the Government has failed to address their issues as well. The organisations of students and teachers of various universities have declared their support. With the wider support emerging than ever before, the workers and their unions are in upbeat mood to make this 2-day strike historic, in order to defend the country’s economy and also defend their rights and to hit back at the Government which is being caught in the web of biggest scam of Rafale deal. The Centre of Indian Trade Unions denounced the unilateral move of the Govt of India to amend the Trade Union Act 1926 in the name of bringing about so called “transparency” and avoiding “duplicacy” as noted the press briefing by Union Cabinet. But the text of the amendment, as available with the Central Trade Unions reveals the dubious intent of the Govt to usurp wide discretionary power with the Govt in the matter of recognition to central trade unions in total departure from existing mutually agreed practices being followed for last couple of decades, based on which verification of membership of central trade unions have been conducted number of times during last three decades. All the ten central trade unions jointly conveyed their opposition to the said Bill and also conveyed specific suggestions for changes on 10th August 2018. But none of the suggestions of the central trade unions has been accepted. Central Trade Unions are confederations of the enterprise based registered trade union entities, which represent the workers in various tripartite or bipartite forums. Definition of the Central Trade Unions or eligibility of being considered as Central Trade Unions had already been unanimously formulated in joint meeting of the Central Trade Unions and the Union Labour Ministry on the basis of a minimum membership (to be jointly decided from time to time by similar joint meeting between the CTUOs and the Ministry of Labour & Employment) and spread over in four states. The proposed Amendment Bill has not deliberately incorporated this unanimously agreed formulation being followed from the very beginning and instead proposed “as may be prescribed” thereby usurping discretionary power with the Govt in the matter of procedure of recognition of central trade unions. Instead of so called “transparency” the Govt has been trying to retain arbitrary power in their hands in order to interfere in the trade union functioning. Already the dubious intent of the Govt stood thoroughly exposed in the manner the Govt has arbitrarily debarred the biggest central trade union in the country, Indian National Trade Union Congress(INTUC) representation in the tripartite committees including the Indian Labour Conference. All the ten central trade unions in the country opposed such proposal of the Govt. Secondly, while the BJP Govt has been showing keenness in re-writing the procedure of recognizing central trade unions, they remain absolutely negative in making the employer mandatorily recognizing the trade unions at the enterprise level. As a result in many workplaces throughout the country, particularly in private sector, workers are being victimized only for forming their trade unions as had happened in Maruti-Suzuki in Manesar, Haryana and the latest of such incident has been in Yamaha in Tamilnadu. Numerous struggles are going on only on the demand of recognition of trade unions in Maharashtra, Karnataka, Haryana, Rajasthan and other states. Existing law empowers the employer not to deal, if they like, with the trade union at the enterprise/workplace level, even if there is a single union. The entire trade union movement has been demanding since long the statutory provision of mandatory recognition of the trade unions at the enterprise level. But the proposed amendment bill totally ignored said long standing demands of the trade union movement thereby allowing their corporate masters to play ducks and drakes with the basic trade union rights of the workers. The Indefinite Strike declared by the All Unions Associations of BSNL (AUAB) starts tomorrow, 3rd December 2018. The massive meetings held in State and District head quarters by the AUAB were participated by hundreds of workers who declared that they will fully implement the decision to strike. BSNL services are going to a stand still. The consumers / people will be put in difficulties, but the workers can’t help, since it is a question of existence of the telecom PSU and its employees. The employees are meeting the press, the consumers and all those connected with the services requesting full support. The panicky DOT and BSNL management had started some discussions, but due to their unjustified and rigid stand, the workers are left with no alternative other than strike. This is a Do or Die Battle and the workers are ready for the same. We demand the government to immediately intervene and discuss and concede the demands of the workers, which are fully justified. Organise 14th November rallies massively, and as preparatory to the forthcoming strike. As per the call of the AUAB, massive rallies are to be organised on 14.11.2018, demanding implementation of the assurances given by the Hon’ble Minister of State for Communications, in the meeting held with the AUAB on 24.02.2018, on the issues of 3rd pay revision, pension revision, allotment of 4G spectrum and payment of pension contribution on the actual basic pay. It must be specifically noted that, in the meeting held on 02.11.2018, between the AUAB and the Secretary, Telecom, not much progress was seen in the main demand of 3rd Pay Revision. In this connection, all leaders and comrades are requested to make note that, the AUAB has already informed the Secretary, Telecom, that, strike would be organised if the demands are not settled by 30.11.2018. Hence, all circle and district unions are requested to take every step to ensure the total participation of the Non-Executives and Executives, in the rallies to be held on 14.11.2018. It is also requested to display maximum number of banners, flex boards, etc., to attract the attention of the general public to our demands, most importantly issues related to allotment of 4G spectrum, the pro-private policies of the government, financial revival of BSNL, etc. All AIBDPA units are requested to make necessary arrangements for maximum participation of pensioners in the rally.